Hawkes is excited to announce the launch of the Hawkes Cidery, London’s first ever urban cidery, stepping up the pace to put cider firmly on the map and bring it into the 21stcentury. Since 2014, Hawkes’s owner Simon Wright has been on a mission to lead a revolution within a craft cider category which has been needlessly left trailing behind the likes of beers and spirits. The new premium production facility will enable Hawkes to explore and push the boundaries of modern cider making in a unique urban setting. He recognised the need for cider to modernise itself and appeal to a new audience in order to stay relevant in the face of Brits’ love affairs with craft beer and artisan gin. 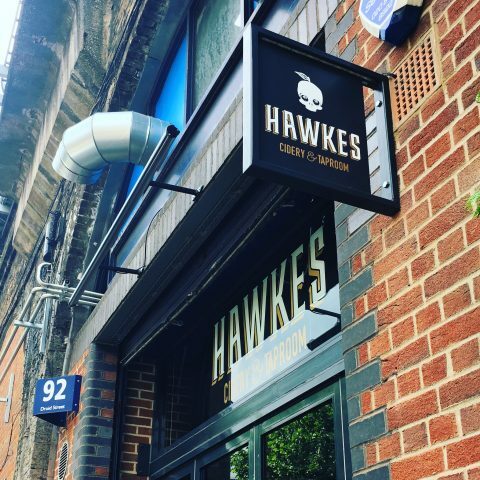 Located on the famous ‘Bermondsey Beer Mile’ just off Maltby Street Market, the Hawkes cidery opens this month and is set to be the heart and soul of craft cider production in London. This follows around six weeks of pressing and getting the general cider production into gear. Hawkes’s own Urban Orchard brand is made from a blend of London-pressed and countryapples: it produces a medium-dry cider that’s smooth and harmonious in body, complex and rich in texture and gives a crisp, wine-like finish. An integral part of Simon’s team is trained winemaker Roberto Bascilico, who has made wine previously at Frescobaldi, allowing Hawkes to explore and push new boundaries in cider making. Housed within the Cidery is a cider taproom, which will be offering Hawkes’s ever-evolving menu of craft drinks including the Hawkes’s flagship Urban Orchard and Ginger Beer products, alongside unique experimental ciders made on site by the brand’s master cidermakers. The Taproom also features a vast array of British, European, and other world ciders to showcase the sheer volume and variety of craft ciders around the globe. It is a place to learn about and celebrate cider, a drinking den, party venue, and a cracking destination for group tours. Top Welsh chef announces his Christmas menu….and there’s no turkey to be found!